It's been a while folks, but here's a podcast for your listening pleasure. I have a few interviews lined up for the months ahead, but today's episode it all about me. I give you an update on living aboard - do you know it's been a year since we moved onto this boat? Opua Arts Studio and Gallery gets a mention and I manage to fill in about 50 minutes of airwaves with general quilty goodness. 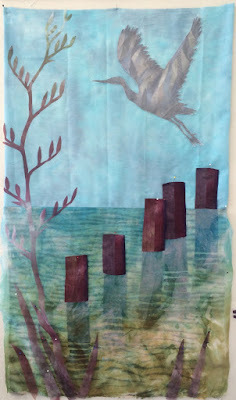 Here's one of the heron quilts I mention. 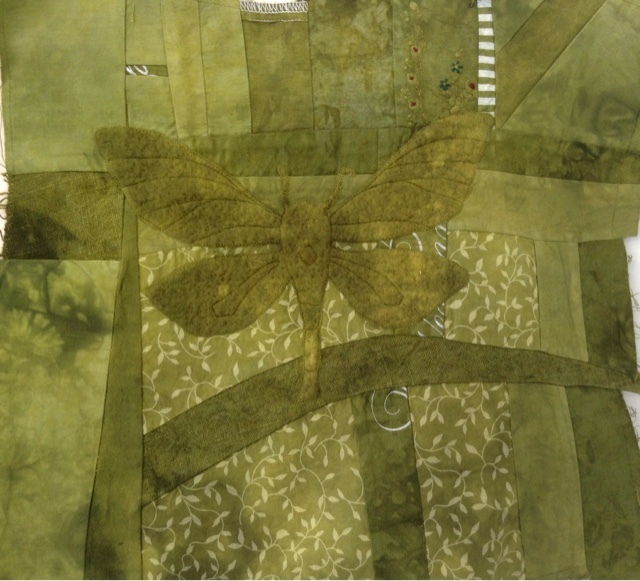 This one is an in-progress quilt hanging on my design wall. 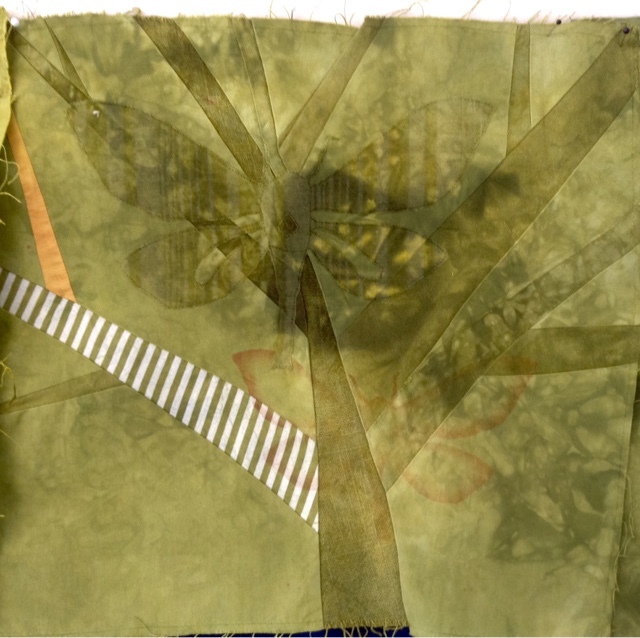 I'm falling more and more in love with using silk organza in my art quilts. Instagram gets a mention. I hang out there as madquiltlady and post frequently (I try and make it everyday) with the hashtag #dyealittleeveryday to show my dyeing projects. 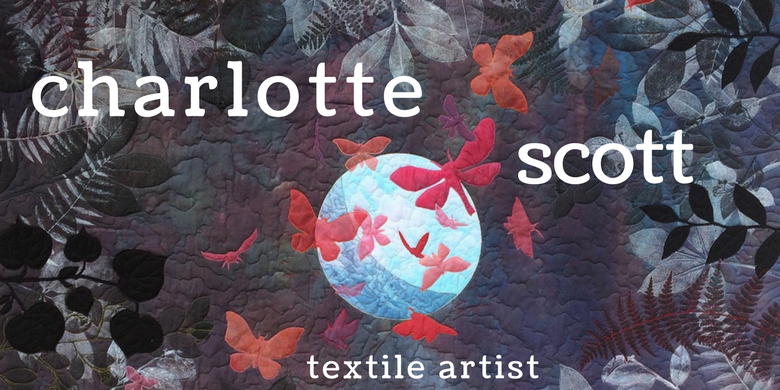 Above is a linen wrap I just finished and hung on the wall in the gallery. Linen is so lovely to work with. 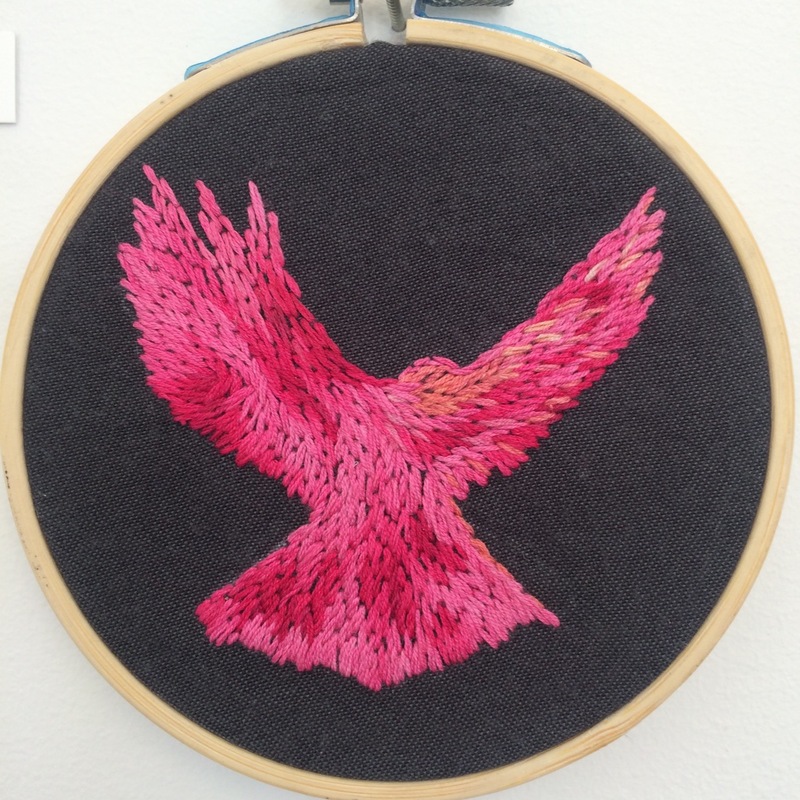 My embroidery skills, or lack thereof, are discussed. I've made a couple of little hanging pieces to show my hand dyed threads. This is the bird silhouette I talk about, I'm not sure the variegation works with the filling in - or maybe I just need more practice with how to work it. 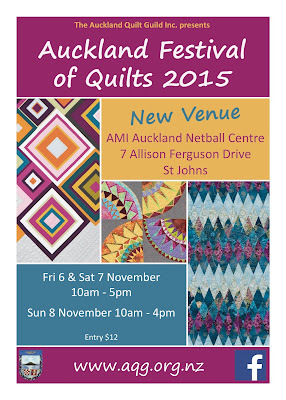 And last, but not least, here's a poster advertising the upcoming Auckland Festival of Quilts. Can't wait! I promised you I'd show you how I was going to rectify the little problem I had of white and cream quilts for a green colour challenge. 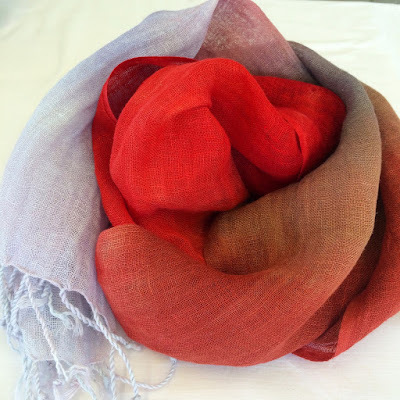 I stitched around the edges of each piece, made up three slightly different dye baths, soaked the pieces in soda ash and then in they went. And now they are GREEN! 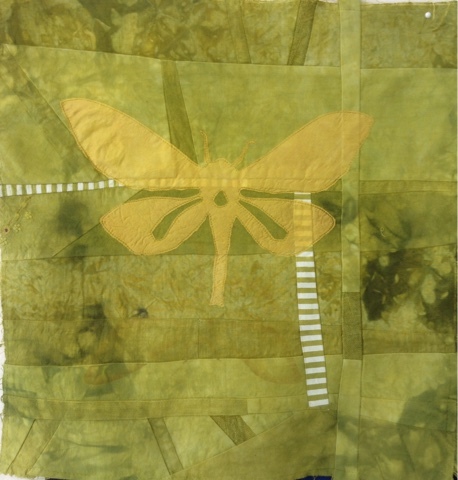 The silk moth didn't take as much of the black (the dye bath was mostly yellow and black) and is quite yellow. Interesting, especially as you do get an occasional yellow Puriri Moth as a variation of the species. And the furry texture of the moth made of batting delights me! I've since added another 'ghost' moth to this was some discharge paste. 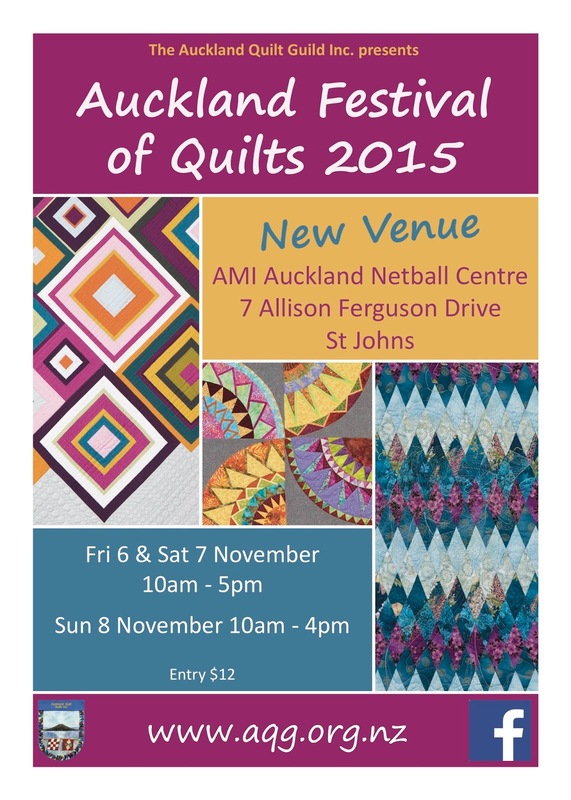 Now it's time for quilting. I think a wood grain would suit, seeing as they eat trees.